I have suffered from carpal tunnel syndrome on and off for fifteen years. Surgery was recommended. I chose acupuncture. My wrist still acts up if I overuse it, but as long as I practice yoga everyday, the pain stays at bay. For those times I do overdo it, I rely on creams to offer pain relief. [amazon_link id=”B00C2OZLHO” target=”_blank” ]Ateevia Botanical Prime Therapy[/amazon_link] is a new product that uses all natural botanical extracts. In a clinical study, 86% of participants experienced significant relief of various inflammatory pain conditions as a result of using Ateevia Prime. The product can be applied as often as necessary; there are no side effects. This product is safe for children to use. As I am not currently suffering from carpal tunnel or any pain, I cannot attest to the effectiveness of this product. It does state that the product is more effective after three days of use. I will update this post the next time I feel pain. I am hopeful! 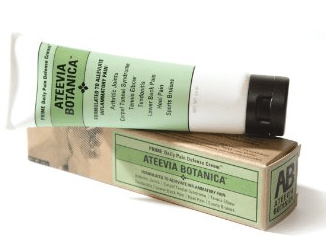 [amazon_link id=”B00C2OZLHO” target=”_blank” ]Ateevia Botanical Prime Therapy[/amazon_link] is made in the USA.